Summer downpours can wreak havoc on basements! Whether you live in a new house or an old one, no house is completely safe from a flooding basement. And trust us, no one wants a wet basement! Just 1 – 4 inches of water in your basement can cost up to $10,000 to repair and dry. That doesn’t even enter in the damage caused to your floors, walls, technology and the possible damage caused to priceless pieces of furniture, photos and other heirlooms. 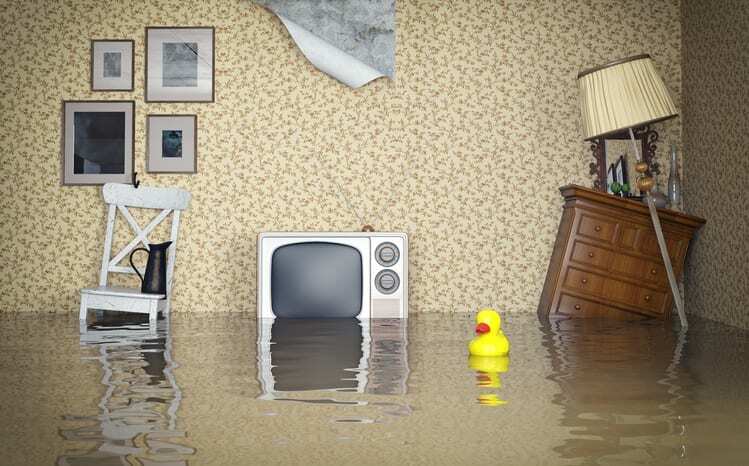 A flooded basement can cost a small fortune you can’t afford. Preparing for a flood before it happens is the only sure-fire way to avoid having to deal with and pay for the devastating damage of a basement flooding. Fortunately, there simple measures you can take avoid them all together. We know it’s a dirty, nasty chore and no one likes doing it… but cleaning your gutters is more important than just keeping your house looking nice. Clean gutters let rain water flow uninhibited through the gutter, down the downspout and away from your house’s foundation. This helps prevent water from building up around the base of your house and seeping into your basement. A good rule of thumb if to direct water at least 3 feet away from the foundation, so extension and/or troughs are never a bad idea. So, grab your ladder and gloves and get cleaning! A sump pump is a vital piece of equipment for any basement. Installed at the lowest point in your basement, water flows downhill and fills up the sump pit until it is triggered to push the water to the nearest sewer or retention pond. You never want to realize your sump pump isn’t working when you’ve got a basement full of water, so make sure to regularly check your unit. It’s as simple as slowly dumping 5 gallons of water into your sump pump and waiting to see if it moves the water. If it isn’t working properly or something seems to be going wrong, make sure to call Chapman Heating |Air Conditioning | Plumbing out to take a look. It could be a quick fix or maybe time to upgrade. Older houses often run higher risks for basement flooding simply because of damage, wear and tear that can occur to interior and exterior foundation over time. Cracks in basement walls and floors are extremely common. If your home has been around to see the last couple decades – or even centuries – make sure to take the time to give your home a proper inspection. Simple epoxy, masonry sealer and similar products can be used to repair cracks and small damages that will let water find its way in to your basement. But, like dealing with plumbing and other home appliances, leave the big stuff to the pros. Window wells for your basement are a great way to let in natural light and fresh air, but they become swimming pools when the rain gets too heavy. If your windows aren’t properly sealed – and even if they are – the excess amount of water build up can lead to leaks. One way to ensure your window wells don’t fill is by installing window well covers. These simple covers are easy to install and come in a range of material and prices as low as $20 at your local hardware or home improvement store. Finding a basement full of water is no time to start thinking about preventing a flood, these simple checks can save you thousands!